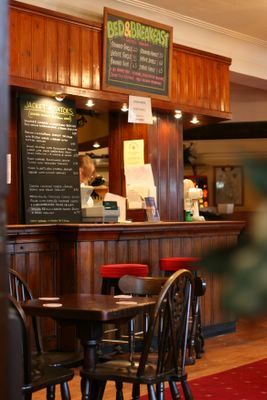 How I would love to be able to sit here and write about the wonderful English Breakfast I ate in the quaint little pub at the foot of the Mendip Hills. Unfortunately, that's not how it happened. 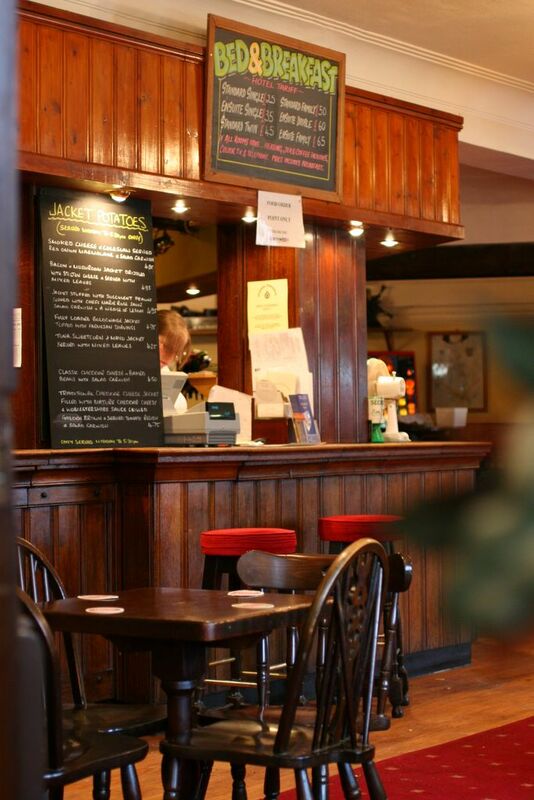 Instead you are going to have to learn about the classic bog-standard English Breakfast that we found in a bog-standard English pub in a small West-Country village. Last week, on my return to England from Dublin at some unearthly hour of the morning, my Mum and Dad picked me up at Bristol Airport and drove me straight to Somerset, about 30 minutes away. I fancied a day out at Cheddar Gorge. None of us had been for several years and so we were all looking forward to it. We hadn't been smart enough or had enough time to do research into places where a good breakfast might be had, so instead we settled for the first place we saw advertising it, a pub in Cheddar village called The Bath Arms. The first thing a Californian might notice upon walking into a pub before 9 in the morning is that not only does the building reek of stale cigarette smoke, people are actually puffing away over their breakfasts. We chose a table in another room and perused the menu. eggs, bacon, sausage, black pudding, beans, tomatoes, mushrooms, fried bread. Dad and I both went for the 5 item special, whilst mum settled for an off-the-menu scrambled eggs on toast with mushrooms. The tastiest thing on my plate was the sausage. This doesn't mean to say it was a good sausage. In fact, it was undoubtedly a horrible, mass-produced, un-meaty, cheap sausage most probably fashioned from the most gruesome of ground-up body parts. The thing is, when I was a kid, I was the pickiest, fussiest eater imagineable and according to my mother, the only thing I would eat was sausages. As I grew up during a bleak period for British food, the kind of sausages I ate and loved in those days were undoubtedly not the wholesome kind I prefer today. Despite being aware of their bad reputation I still have a soft spot for them to this day. Everything else on my plate was under par. The bacon was too salty, I was never a huge lover of bacon anyway. The egg was overcooked. I eyed dad's less-fried egg enviously as his yolk spread across his plate whilst my own upheld its hemispherical shape, solid, in the centre of the white. The tomatoes were hard and not grilled enough, the mushrooms, apparently deep fried, were downright awful. The poor things had been rendered totally inedible in a vat of tasteless oil. I was almost coveting my mum's simpler scrambled egg breakfast dish, although her mushrooms were just as abused. All was not lost, I filled myself up on some simple white sliced toast with butter and marmalade and a large pot of strong black tea. Next time I have an English breakfast I am going to make it myself, here, in California and despite the lack of English-style sausages and the right kind of bacon in these parts, I can guarantee that it will taste one hundred times better than the sorry Bath Arms version. As this post contains both egg and toast, I hereby declare it to be an entry for this month's edition of EOMEOTE, End of the Month Egg on Toast Eggstravagnza which was started as a joke by Spiceblog and Jeanne at Cook Sister and this month is being hosted by The Passionate Cook. Disclaimer: Not all sausages or breakfasts in England are this bad. To the contrary there are some truly amazing and delicious sausages to be found in the UK and many places that actually know how to cook quite a decent English breakfast. Too bad that 5-item special wasn't good, because I love the items that were served. With the correct execution, I bet it could be wonderful! Sigh, a poor English breakfast in England, must have broken the heart. It's like getting a crap cup of coffe in Italy etc. Well done on identifying that the rules do not stipulate that they have to be made by the poster. I was wondering when someone was going to be slackerly ingenious enough to work out this. cheating thats what I call it! Agh! That sorry breakfast gives me more appreciation for the lovely ones I've seen on this site: eggbaconchipsandbeans. I've found it a nice site to visit to find good breakfasts when visiting London. Sorry you had a lousy experience! Bleah! Jen - we should try and find a place that does a good version of this in SF, otherwise you'll have to come round one day and I'll try and recreate it. Owen - yes of corse you are right about the mushrooms. There are some great English versions to be had. I think especially in the late 80s when vegetarianism was very trendy, everyone started putting mushroom dishes on their menus. Anthony - ingenious, of course, but slackerly???? Ok, well, maybe a little. Andrew, it's ok, I give you permission to steal my idea. 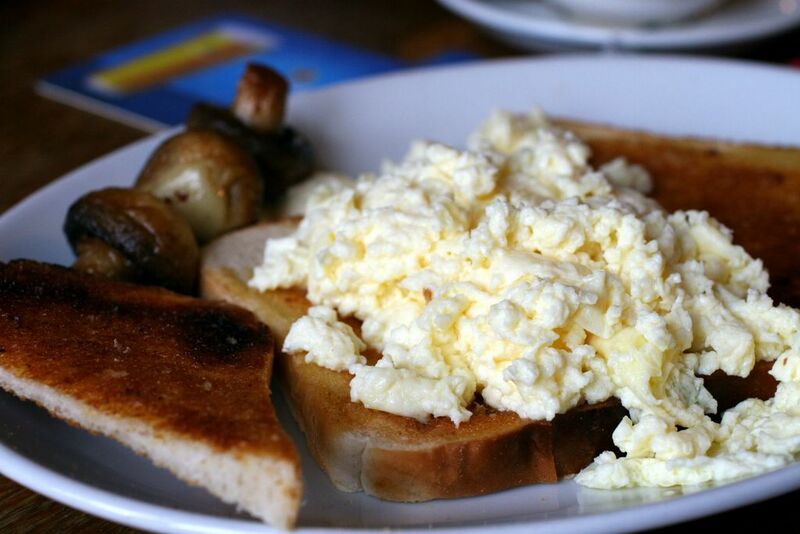 Maybe you could 'bowl us all over' with a better example of English Breakfasts. Mark - thanks for the link to that site. I found it a while back but then lost it. Now I am going to add it to my blog roll. Cheers! Oh how funny! And how right - English breakfasts range from the extraordinary to the execrable, which is quite interesting, given that they all consist of variations on the same limited ingredients. I've had cardboard sausages and bacon so salty I ate it with lashings of marmalade just to take the edge off... But on the other hand, I've also had truly wonderful breakfasts (one that stands out was at the Wroxham Hotel in Norfolk) - many of them at totally unlikely-looking greasy spoons. 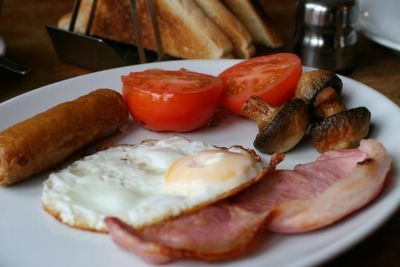 The one thing that is missing from their list of items (and one of the things that makes the English breakfast truly unique) is fried bread!! So bad, it's good. I have actually eaten at the Bath Arms and found that the breakfast there wasnt as bad a you describe it, you may of just had an off day.